LGI Homes Opens New Community in Tucson With New Floor Plans | LGI Homes, Inc.
Building homes with great value and great prices in excellent locations throughout Texas, Arizona, New Mexico, Colorado, Georgia, North Carolina, Florida and Washington takes something special. Thank you for choosing LGI Homes. Now that you're a home owner, we want you to know that we are just as committed to you today as we were when you were a home buyer. We've taken an interest in first-time homebuyers, and have made it a priority to provide them with high quality homes and affordable financing options, and a no-stress home purchase process. TUCSON, Ariz., Feb. 07, 2019 (GLOBE NEWSWIRE) -- LGI Homes, Inc. (Nasdaq:LGIH) today announced the grand opening of a new community in Tucson. 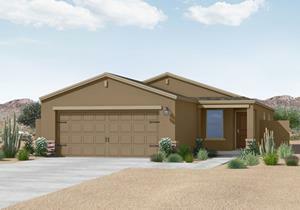 The Ironwood 3 bedroom, 2 bathroom home is available at Cantera by LGI Homes starting in the $220s. Cantera offers a selection of brand-new floor plans, allowing customers to choose from a range of three- to five-bedroom, one- and two-story homes. A new community park will be built within the neighborhood and will feature a children’s playground, picnic pavilion and grills, walking paths and open green spaces. Homes at Cantera are available for quick move-in starting in the low-$200s. Interested homebuyers are encouraged to call (855) 253-9683 ext 307 or visit LGIHomes.com/Cantera to schedule a tour. Headquartered in The Woodlands, Texas, LGI Homes, Inc. engages in the design, construction and sale of homes in Texas, Arizona, Florida, Georgia, New Mexico, Colorado, North Carolina, South Carolina, Washington, Tennessee, Minnesota, Oklahoma, Alabama, California, Oregon and Nevada. The Company has a notable legacy of more than 15 years of homebuilding operations, over which time it has closed over 28,000 homes. For more information about the Company and its new home developments please visit the Company's website at www.LGIHomes.com. *Prices and interest rates are subject to change without notice. Homes pictured may not be available at the lowest advertised price. Advertised monthly payments are based on principal and interest assuming a fixed 30 year term with no money down. Other fees such as taxes, homeowner's insurance and HOA fees are not included and will result in a greater actual monthly payment amount. 100% financing available through USDA, eligibility requirements do apply. Equal Housing Opportunity | Copyright © 2019 LGI Homes, Inc. All Rights Reserved.